I did but then I’m used to spotting such things as the same trick is used by lottery system sellers. What Derren did was take a woman at random and feed her horse racing predictions. She was aware that she was part of an experiment, and that ‘The System’ was supposed to be a way to guarantee picking winners every time at horse racing. For the first race she was given a winner and told to just watch the race. Once the predicted winner rode home her confidence was visibly boosted. The next race her own money was at risk. To her great excitement, she won again. A third and fourth time turned her into a firm believer that The System was real, and completely proven. After all, four winners out of four races, what are the chances of that? For the fifth race, our lucky winner got to meet the creator of The System. And here’s where Derren revealed to her how it all worked. No, he wasn’t psychic or the discoverer of some mathematical miracle. Neither was he plain lucky or working with secret stable insider information. It was simply a con. A well carried out con. Her perception was that The System worked because she won every race. But this was only her perception, and that of the viewer with the information revealed so far. The reality however was very different. Because she was not the only person in the experiment. In fact, thousands of people all believed they were the only one! Derren had simply covered every possible outcome. The thousands of people who had been allocated the losing horses in race one were simply thrown out with apologies, while all those given the horse that won moved on to race 2. Then Derren simply split them down again between all the horses running, and again only kept those that it turned out had been given the horse that won. Repeated over race three and four, there was just one very happy woman remaining – and thousands of not so happy people who knew The System did NOT work as promised. So How Does This Relate To Lottery Systems? It’s in the promise, and the perception of reality. The promise is that the lottery system can help you pick winning numbers. The perception is that it works – read those testimonials! It’s quite possible those testimonials are entirely real, but the reality is they come from a very distorted perception. Because if you con enough people into using your lottery system then some are definitely going to win – not because your system works, but simply because you cover all the outcomes! Now the likely reality here is that system sellers don’t actually manage to con enough people to cover all the outcomes. But it doesn’t matter because they have this covered too – nobody is thrown out when they lose. All they have to do is say stick with it, the system does work, try again next week. A lucky winner doesn’t ultimately care if they win a lot of money on week 1 or week 101, their perception is they won. The reality is they won due to random chance only, as the thousands of people who lost using the same system should realise. So the next time you are promised lottery numbers that have a better chance of winning, think about what perception of reality you’re actually being sold. And if you’d like to know more your chances of winning the lottery, and the facts about what you can do to increase your chances please get my free lottery tips. So what did you think of Derren’s new one-off special? Did you guess early what was going on? P.S. 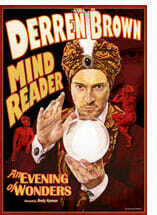 Want to know more Derren Brown secrets? And how he does those crazy mind voodoo tricks check out this video. Cool glad not everyone believes this stuff. Everything he does is a trick, and he normally shows it. Almost turned the rubish off when he said he couldn’t reveal his prediction until after the results for legal reasons. Didn’t the advert say he would predict this before the draw? Not a legal expert but assume that’s another lie. Who can tell Channel 4 they’re not allowed to predict winners? What about the pundits on the racing? Derren Brown might be a good showman and entertainer, but he does a really bad job, claiming his tricks are based on some psychological processes etc, etc. He’s feeding the audience horse-sh*t pseudo-science (and since it is partly right, it makes it more believable). He himself has created one of the biggest scams in his life, claiming to have super-deep understanding in things he does. And since he claims to “teach people how to avoid scams and con artists” it is harder to prove him as fraud. Also I just love how some of his “tricks” don’t even envolve him doing anything. Like “horse racing”. So? What did they prove? If you have some spare money you can fool a lot of people? Why are people so annoyed with entertainment? This guy entertains for a living and does a hell of a job at it! He’s feeding the audience what they want, and what they want is a good show! He’s done well for himself, if he’s not your cup of tea then don’t watch, it’s simple! It’s like people say ‘it’s a trick’… well yes we know that before even watching it, why state the obvious in such a negative way? Pointless if you ask me! Just watched Derren Brown’s Svengali was amazing; obviously it’s all tricks so dont get annoyed. He doesn’t claim to be a magician. He’s an illusionist. Entertained? How, if you know it’s a trick, and know how it’s not truthful (he predicts nothing), how is it entertaining? It amuses that you know that the vulnerable… the old, infirm, and mentally ill and challenged who still have bank accounts, many employed, and victimized by slimey scam artists pushing lies, taking money from our most desperate who cannot afford to miss a rent or mortgage payment. This man and his kind, are evil predatory rapists of people’s fragile security.